The Focus of our business since its inception, has been to listen to our customer’s requirements, ensure that our understanding is consistent with our customer’s requirements, then aim to deliver a service package at least equal to those requirements. This in itself is not a unique phenomenon; it is the ability to consistently match the correct skill set to the task at hand. With time, we have learned and developed the skill to listen and understand what is actually required, engage, refine when possible, and then to deliver on budget and on time. I am passionate about the delivery of Service; I do believe we are only as good as our last job, and the only road to success is behind successful people. The successful people in our business, are our apprentices, our tradesmen, our drivers, our planners, our support staff and management team. My team and I strive for Success and we would be delighted to meet you to discuss and listen to your needs. HTS have recently opened a brand new, state of the art spray painting booth, commissioned in 2012 at the Sutton Weaver depot. Paint Spraying, Customer specified paints including colours from the RAL and B.S. ranges are facilitated in our spray booths, using airless and air assisted paint equipment. We have been certified by Jotun International paints as an approved applicator. The ample size of our brand new fully heated paint booth means that we can accommodate most sizes of components, thus enabling us to meet a wide range of standard and bespoke requests. Large items can either be suspended from a ceiling bearer or painted either on trolleys or in specialised stillages to achieve maximum efficiency and optimum paint quality. HTS has also invested in a smaller scale facility in Teesside. This allows increased options to our customers by having a fully commissioned facility in both the North West and North East depots. Shot Blasting HTS have recently opened a brand new, state of the art Shot Blasting facility in Sutton Weaver, Runcorn. This facility is large enough to hold 40 foot containers and road barrels and allows us to be flexible with our customers’ requirements. Shot blasting is our recommended method of surface preparation; our brand new facilities for this process give added benefits including: High production rates and blast pattern accuracy. The ability to clone and profile almost any surface required by virtually all coating manufacturers. We can accommodate most sizes of components. We ensure that components that require coating are sprayed within four hours to prevent oxidization. HTS also enjoys a smaller facility in Teesside working alongside the facility in Sutton Weaver. The unit in Teesside is designed to blast smaller items, such as; vehicle wheels, bulk LPG tanks and other bespoke items, as required. August 2013 We were asked to convert several new shipping containers into a bar, fast food outlet, burger bar & cafeteria for the Family Park at Liverpool Football club. This was a very enjoyable contract and the customer is more than happy. July 2013 HTL & DENNISON TRAILERS agree a rolling build program for 44T ADR chassis suitable for the carriage of 30ft and 20ft equipment. April 2013 HTL procures and refurbishes rigid Hiab to service containerised customers in North East. Feb 2013 Delivered in person by HTS Development Manager: Hugh Daly. A purpose built Off-Shore Cinema & Entertainment Complex for Land & Marine Project Engineering Ltd.
Dec 2012 Hull office opens with Tony Lill as new manager. Dec 2012 HTS Sutton Weaver (Runcorn) wins approval for Blast and Paint works for major Oil Industry Supply company. 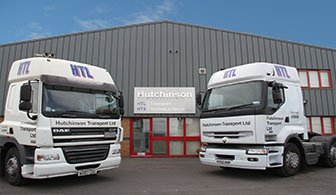 April 2012 HTS North West moves operation from Ditton Rd Widnes to SUTTON WEAVER, Runcorn.